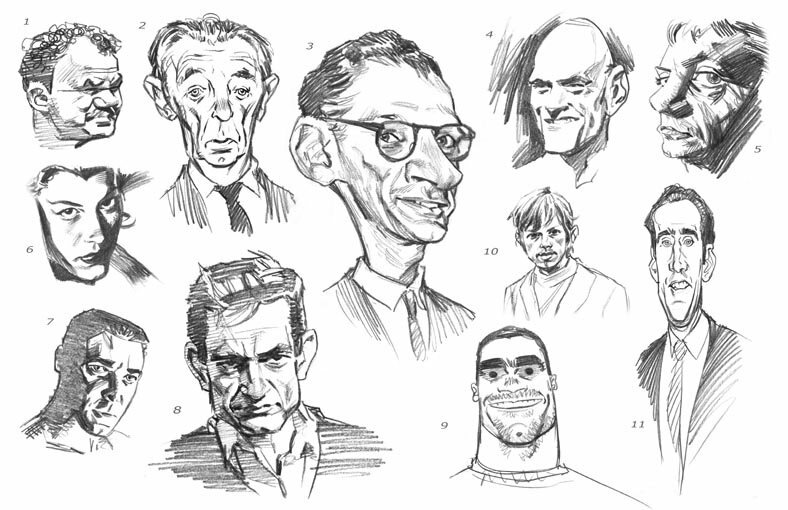 These are celebrities drawn from various magazines over the years which have accumulated in my sketchbooks. See if you can guess who's who before reading the names below. Some are Australian celebs, some are from the 80's, some are simply just badly drawn. Chris...genial trabajo por mi parte he puesto un link en uno de mis blogs. I got about 7 right. I didn't get 1,3,5 and 6, but I should have gotten Melissa Auf der Maur - it's totally her but it didn't register. And MAN I love that pic of her. It's my personal favourite of the lot. Thanks, Maggie. I'm glad you're enjoying it. That Henry Rollins pic is spot on. Neck like a tree that guy.